It is 10:45 a.m. of the penultimate day of 2011. Alex, my 6-year-old son, and me, after a grueling journey to the Arcade Bus Station on a motorcycle taxi, whose trailer just about accommodates the both of us and our scanty luggage, are boarding a bus to Chiang Rai. 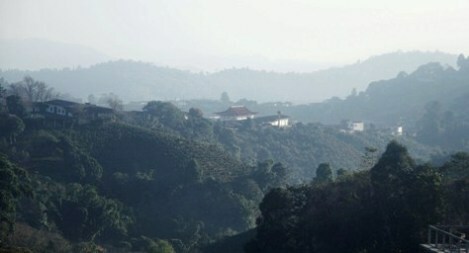 Our journey’s destination is Doi Mae Salong. 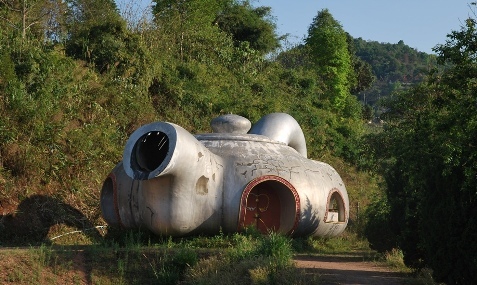 I had paid a short visit to the Chinese town, located high in the mountains of Northern Thailand, two months earlier during a visa run, and that visit had aroused my curiosity and set a ball rolling. Although already my third visit of the Chinese mountain enclave in northern Thailand, the tea production that is now typical for Doi Mae Salong and coins the townscape had come into the focus of my attention for the first time: a wide range of professionally grown and processed green teas, oolong teas and naturally flavored teas, and more recently, probably due to the relevant demand from the West, also black (Chinese: “red”) tea at very reasonable prices direct from the manufacturer. 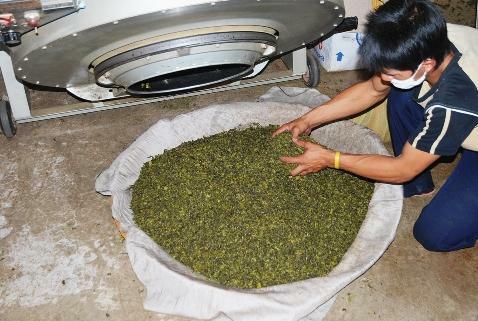 Thai, and thereby Doi Mae Salong tea, especially the Thai “Formosa” Oolong tea imported from Taiwan since little more than a decade has set out to acquire an international reputation for its high quality. 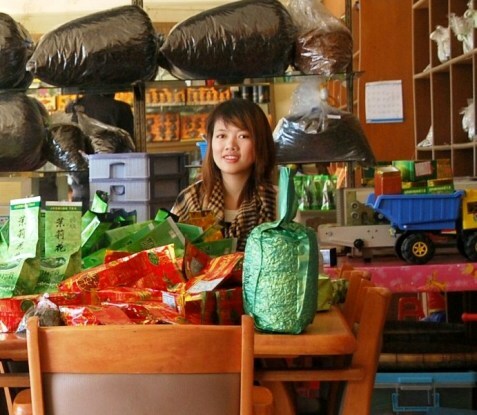 In the US, however, these teas are still scarcely available, the few providers ask considerable prices. 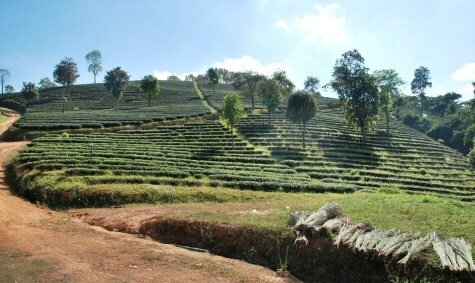 One reason may be that the plantation areas in Thailand are limited because of the high quality tea’s need for an altitude of at least about 1200m, and the country therefore produces “only” a volume of an estimated 200-300 tons of tea per year, which, while a considerable heap of tea, is certainly not enough to attract the interest of the tea industry’s larger, internationally active trading companies. After some research and countless cups of Oolong N ° 17, I was now on my way to Doi Mae Salong in order to check out in detail the locally grown tea products, pricing and availability, learn more about Doi Mae Salong tea in general and finally to obtain representative samples for testing. 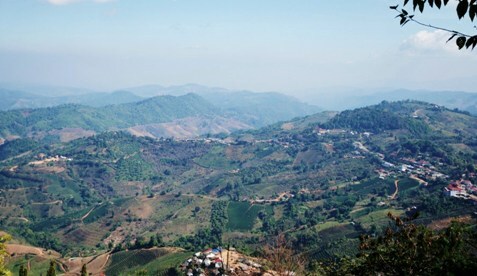 The road from Chiang Mai to Doi Mae Salong leads inevitably via Chiang Rai, the second largest city of Northern Thailand. Our bus, the air-conditioned “luxury version” of a Thai line bus, will only take approximately 3 hours for the 185 kilometer route to Chiang Rai and offers the advantage of a guaranteed seat. We take our seats and off we go on our journey’s first major leg. 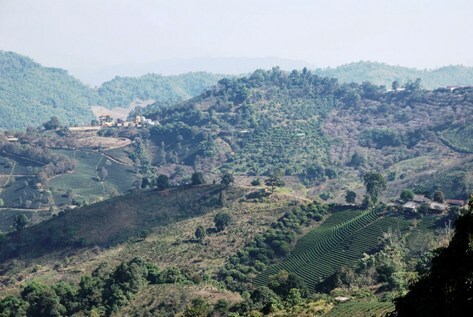 The road first leads through flat country, dotted with settlements and agricultural areas, interspersed with occasional trees, reminiscent of the dense forest carpet that once covered the whole territory around Chiang Mai. Here and then, we pass through a typical Northern Thai town, whose main streets are seamed with houses, shops and workshops of all kinds, along with food stalls, street kitchens and small restaurants. 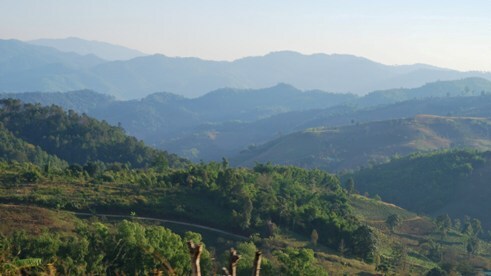 On the part of the way, real forest can be seen only in the distance, a green blanket spread over the mountains that border the plane on the far horizon. After a while, we start moving slightly uphill. Trees, mountains and abysses are moving in closer an closer on both sides of the street, interrupted by small villages, fields and clearings overgrown with grass and scrub, at times allowing some short insights into tranquil green valleys. Passing by the horizon’s soft line and the beauty of the landscape in front of it exert a calming effect on me. Due to the New Year’s holiday, there’s a vivid travel traffic on the road, an elephant trail 50 years ago, and still predominantly used by bicycles and bullock carts just 30 years back in time. Alex keeps up with last night’s short sleep, so I can enjoy watching view the passing scenery and indulge in my thoughts without disturbances. Doi Mae Salong … I had been there 19 years ago, during my second trip to Thailand (which I never really came back from), for just one overnight stay. At that time the city had been a kind of Chinese Wild West that lived from the opium trade and seemed to be widely oblivious to the influence of the Thai law and regulative authorities. I will never forget, when me and my traveling companion at that time in the middle of the night were startled from sleep by a group of Thai soldiers, armed with machine guns that stormed into our room without knocking. Fortunately, we quickly turned out not to be what they had been looking for, and the soldiers disappeared just as quickly as they had turned up. Although this was my most formative memory of Doi Mae Salong to date, the place in my perception was also haunted with an exotic and mysterious, almost mystical aura. 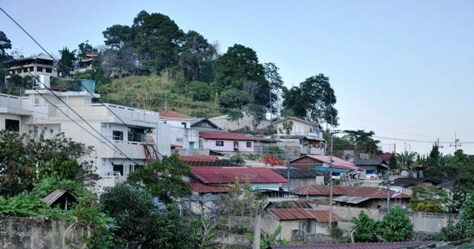 History and development of Doi Mae Salong make the small City, inhabited by about 25,000 inhabitants and located an altitude of up to 1600m above sea city, a particularly special and unique place. where they initially endured in order to resume their conter-revolutionary struggle at given time. However, Mao and his Communist Party very quickly succeeded in cementing their power all over China. Military action against the revolutionary army was doomed to failure, a return to China impossible. The communist revolution enjoyed a reputation for their course of action with counter-revolutionaries, if they got their hands on them. From Burma, groups of these Chinese Kuomintang soldiers soon started migrating to Thailand and Taiwan, where they formed typical Yunnanese settlements. The most renowned of these communities in Thailand is Doi Mae Salong, a small, picturesque town, situated amidst the magical scenery of the Northern Thai highlands. 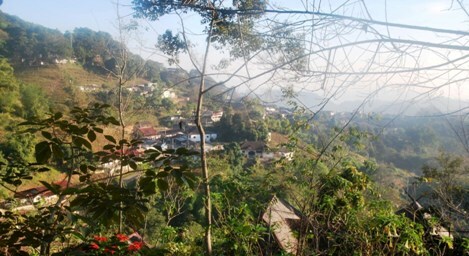 The area is part of the legendary Golden Triangle, and it can be assumed that the Kuomintang-Chinese Doi Mae Salong had their share, if not played a decisive role in the flourishing opium trade, for which the Golden Triangle has gained a worldwide reputation. The early departure Thailand’s from the opium cultivation on a commercially relevant scale, compared with Burma or Laos, is owed to Thailand’s royalty, particularly its ruling monarch since 1946, King Bhumibol Adulyadej. King Bhumibol, for decades in many ways a blessing for his country, recognized early on that it was useless to fight the opium cultivation and trade only with the adoption of relevant laws and their their police and military enforcement, since that trade represented a major part of the Northern Thai people’s economic and livelihood foundation. He realized that he could not just deprive the people of this economic basis, without offering a replacement. 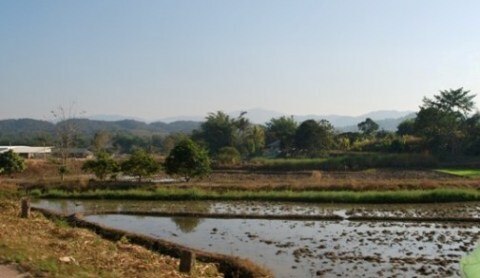 Extent and sustainability of the Royal Thai agricultural projects are worldwide exemplary. 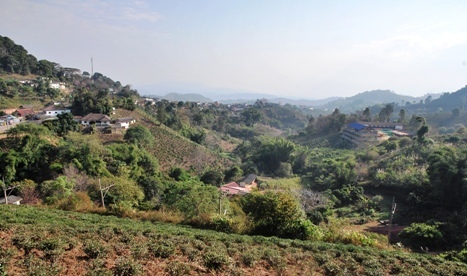 Ultimately, the relevant efforts of the Thai royal family play a key role in the territory’s transition from opium trade to tea cultivation, and, to a lesser degree, some other cash crops, within just a few years. 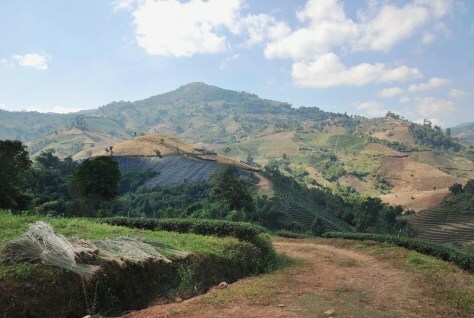 The community of Doi Mae Salong made the best of it. 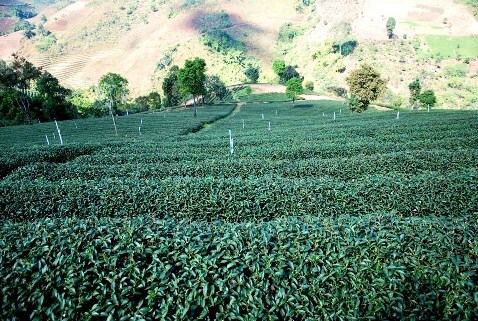 The region now produces about 200 tons of tea annually, and in particular the quality of local Formosa Oolong teas, for which the plants were originally imported from Taiwan, has been steadily gaining in worldwide reputation during the last few years for their distinctive, delicate flavor as well as their health benefits. 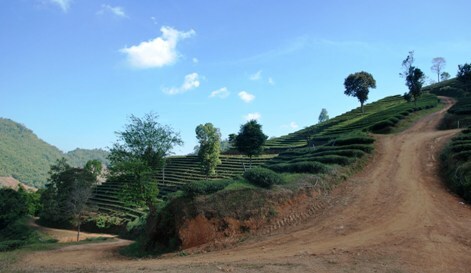 Doi Mae Salong is just perfect for tea cultivation. 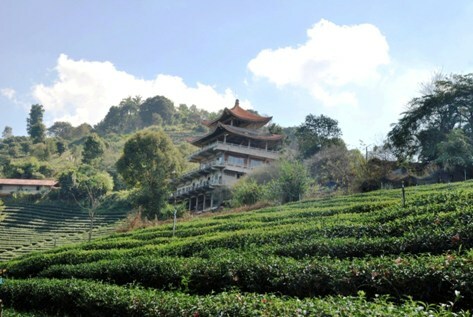 Altitude, topography and climate, conditions similar to those of the Taiwanese cultivation regions, from which the tea plants were imported, enable the cultivation of fine green teas, oolong teas, and more recently, also black tea. 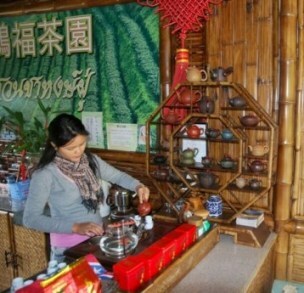 The region also produces a number of teas naturally flavored e.g. with jasmine flowers, Thai jasmine rice or Ginseng roots. 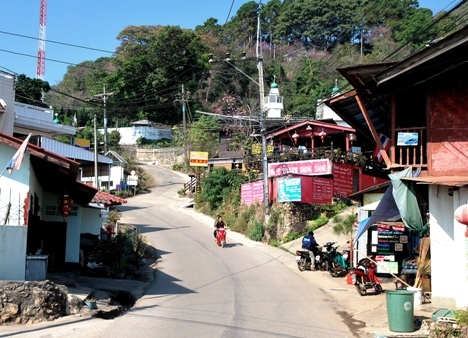 While 20 years Doi Mae Salong’s daily street market appeared as a homogeneous fusion of Yunnanese village setting and touristic purpose (snakes and other animals in alcohol along with other obscurities), the town’s 3 km long main street, mostly consisting of sharp curves and steep slopes, today is completely dominated and characterized by the tea trade. The snakes in alcohol have disappeared (now banned? ), but instead even the shops that offer something else than tea, too, still offer mainly tea, and everything about tea, for that matter, such as ceramic teapots, cups and complete tea sets, Chinese tea tables, tea-warmers etc. Town’s edge is mainly home of a range of “tea factories” (larger wooden shed with signs that reveal Chinese characters, meaning something I will probably never know what it is) and a handful of classier tourist resorts, skillfully hidden in order not to disturb the traditional townscape. 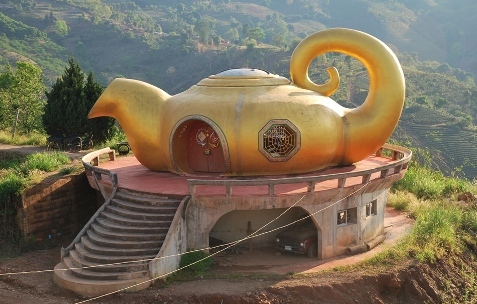 Today, in Doi Mae Salong tea ist virtually omnipresent. Arriving at the bus station in Chiang Rai, the next stage of our little journey is to be organized. This will bring us to Mae Chan, a small town situated halfway between Chiang Rai and Mae Sai, a Thai border town with Burma. In Mae Chan then, a road leading further into the mountains and finally to Doi Mae Salong, branches left off the highway. In order to fully get to enjoy the scenic beauty of this 30 km ride, we decide to rent a Tuk-Tuk. 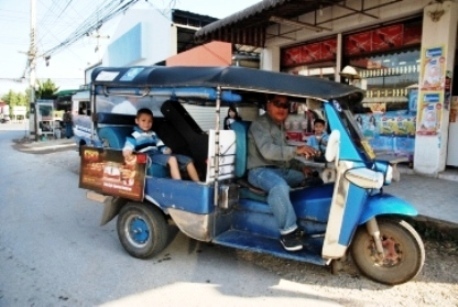 A tuk-tuk is a typical, gas-powered Thai taxi that can hardly be described with words. The following photo of our tuk-tuk to Mae Chan occupied by a happy Alex may therefore serve as an illustration. After about three quarters of an hour drive through a landscape that is largely similar to that between Chiang Mai and Chiang Rai, our tuk-tuk suddenly takes a left turn and then after a few meters comes to a halt in front of a typical Thai mom and pop shop. We are in Mae Chan. There, a blue Songthaew taxi (pickup truck with the half-open cabin converted cargo area) is already waiting. 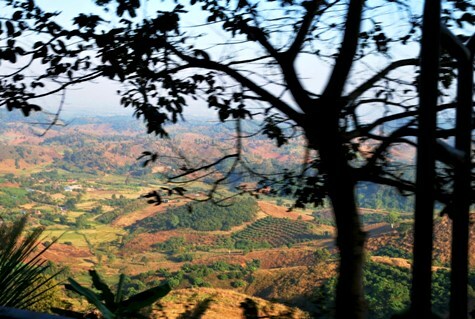 From here, the journey to Doi Mae Salong is like a journey into another, magical world. After we’ve left Mae Chan behind us, the road, apparently consisting of an endless series of hairpin curves, leads steeply uphill. We spend most of the trip hanging out the open side windows with our cameras’ focusses pressed to our eyes, in order not to miss any of the spectacular shots passing us by virtually in series during the 20 km ride. There it is! In a valley far below us to the left, I finally see it: The first tea plantation! 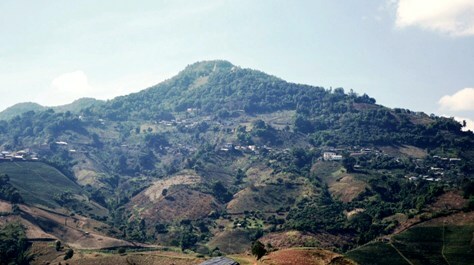 This means we are now at an altitude of about 1200m and Doi Mae Salong can not be too far away. The view on the road we have come, now deep below us, is staggering. 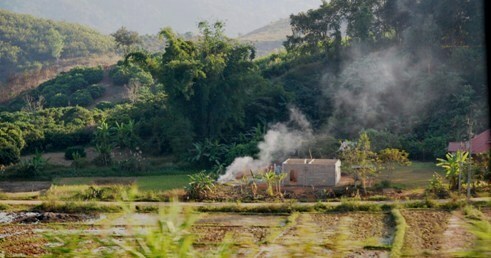 Now and again we see smaller bunches of wooden and bamboo huts, roofed with leaves and straw, being the home of some of the different hill tribes local to this area. The panoramic perspectives on the Northern Thai mountains are so stunning that I almost regret that we will now arrive soon. Finally, the houses on both sides of the road grow in regularity and frequency. 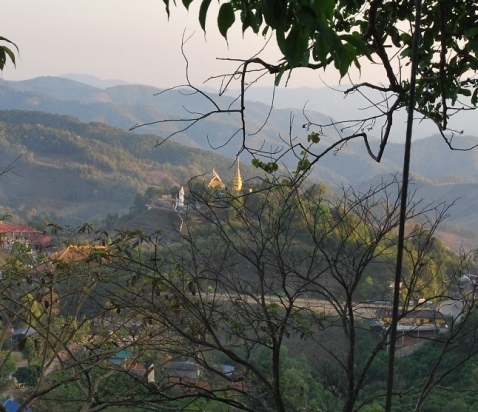 We pass a final military checkpoint, and around the next bend Doi Mae Salong comes in sight. 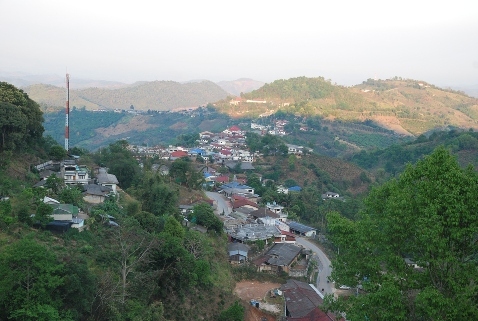 A minute later, our taxi rolls up and down the 3-km long, tortuous of the strange Chinese town situated right in the middle of the Northern Thai highlands. There seems to be hardly a house in this town, whose residents do not operate any type of business: Accommodations, restaurants, household goods, groceries, shoemakers, hairdressers, agricultural products of all kinds, shops whose purposes cannot be identified at first sight, the mandatory 7/11, and, of course, tea. 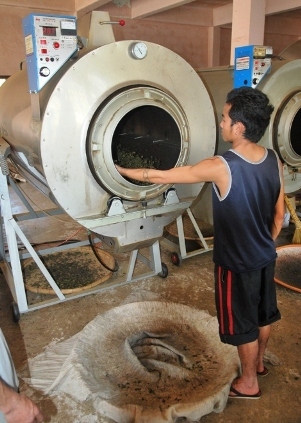 The estimated percentage of shops selling tea from their own cultivation and processing is at least a quarter. Right in the center of town, around the obligatory 7/11, about 5 budget Guest Houses in backpacker style are grouped (recommended: Shin Sane Guest House). You get a room with private hot shower here at about 6 $US per night. For additional 2-3 $US, the room even comes with a TV. I tell our taxi driver the name of the resort I had booked (the Khum Nai Phol Resort, close to the town’s center, a little more expensive but, as it turns out later, for justified reasons) and he agrees to take us there. The bungalow that is assigned to us after a friendly welcome, is a small jewel, consisting entirely of teak wood, and crowned by a spacious, tastefully decorated bathroom with a bathtub therein. 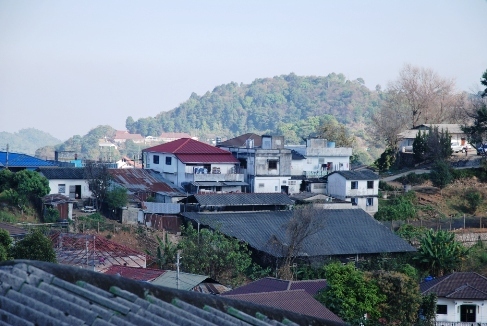 The balcony of our bungalow overlooks the part of town closer to us on the left, while on the right hand, we enjoy a view over some gentle slopes covered with tea plantations, perfectly blending in the townscape, bordered by Doi Mae Salong’s more remote part in the distance. While completing the formalities at the reception, we learn that our stay coincides with the Doi Mae Salong Tea Festival, held annually from December 25 to January 02, which probably means as much as nightly music and dancing until late hours. What else it does mean, I will unfortunately know only many kilometers spent climbing up and down Doi Mae Salong’s main road later. Moving on foot in the evening Doi Mae Salong proves twice as cumbersome after dark, since the already narrow road, resembling a roller coaster, doesn’t have any sidewalk and is a traffic hustle and bustle due to the New Year’s holidays and the tea festival. 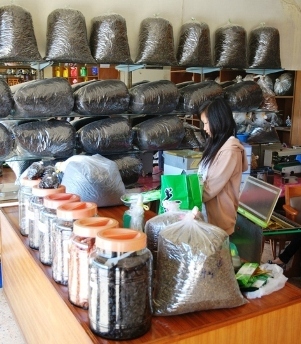 It is customary in the tea shops of Doi Mae Salong to not only grant visitors an apparently unlimited free tea tasting, but actually to virtually force people to try never ending cups of different teas, so that the visit of only a few of these stores is already associated with a considerable time investment. 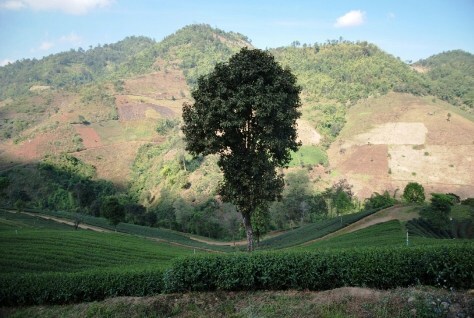 Hence, we spend the next few hours with a walk through Doi Mae Salong, stopping by at a series of tea-shops, where we piece by piece drink ourselves through the region’s entire tea portfolio. The people hosting us are all so nice and friendly that we hardly manage to get away somewhere without suffering a considerable guilt complex. Finally, we end up in a shop, whose offer completely convinces me. There are different varieties and qualities of local Oolong tea, green tea, jasmine tea, tea flavored with rice, so-called 4-season tea as well as Jiaogulan tea and ginseng tea, in other words: all I’ve been looking for. The young girl guarding the otherwise abandoned shop provides answers in a shy, but friendly manner, and we decide to accomplish our tea purchases here the next day. 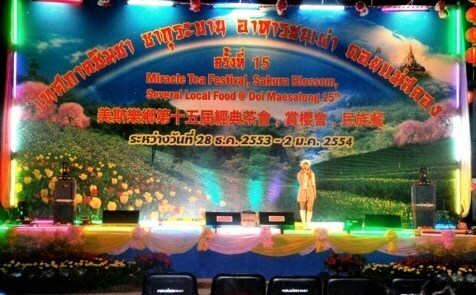 Next, we pay a visit to the Doi Mae Salong Tea Festival, held not far from our resort. The musical entertainment shown on the festival stage on this evening sonicates the entire town and had already accompanied us on our previous tea shop odyssey. Arrived on the fairgrounds, the first thing we notice is that we’ve done all the mileage for nothing. 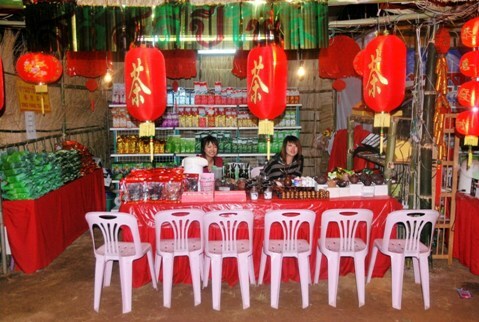 The seven-day, annually held festival serves as a promotion platform for the local tea products and their manufacturers, and therefore each tea producer from the entire area has a booth where they present their full offer in a neat manner. 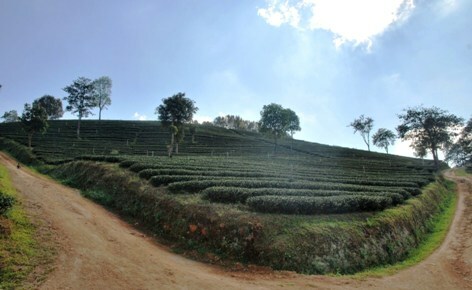 A comparatively manageable, about 100m long series of tea-shops on level ground vs. a kilometer-wide mountain and valley hike through Doi Mae Salong. 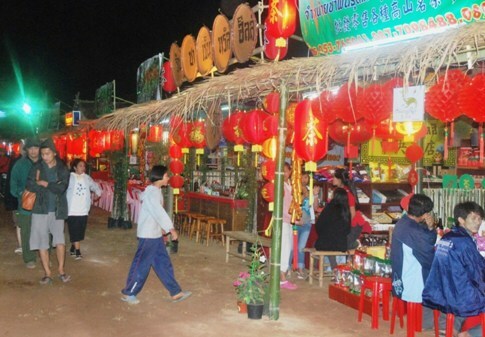 The initially rather small crowds increase after dark, and more and more curious and interested visitors gather around the stalls to look at tea, try tea, negotiate prices and make purchases. Again, we try tea and it isn’t long until we have identified the festival representation of the tea shop/producer we previously identified as our chosen place of purchase. The company is a family business, with one of the daughters attending the factory’s store on that evening and her two sisters running the festival booth, while Mom constantly commutes between the two locations. After a few cups of tea, lots of questions and just about as many patient answers, we are invited to visit the family-owned tea factory the next morning, an offer I happily accept. The musical program on the festival stage consists of ever changing local singers, accompanied by CD recordings. For dinner, there is Yunnanese roast duck with cooked spinach leaves in a small Chinese street restaurant adjacent to the festival grounds. The next morning, however, we first have look for a new accommodation, because our resort is already fully booked on that day. Again, it goes up and down the road, this time with luggage, and I regret for the first time having brought my guitar including case along. We are lucky. After only about 500 m, we find an acceptable room for the second night in the “See-See Guest House”, which usually comes at 15$US per night, but because of the holiday traffic, it costs twice as much now. The terrace of our bungalow offers a much less spectacular view than our previous abode, but the room is okay and we content ourselves. Half an hour later, we are at the tea factory, where a fresh supply of Oolong No.12 is just about to be unload and spread out in the sun in front of the factory. 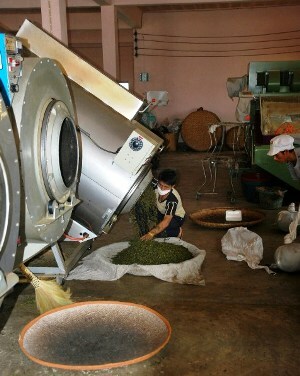 During the following tour and demonstration of the processing of the tea leaves, many so far unresved mysteries resolve, such as the question of how the Chinese manage to roll each individual tea leaf to a little ball (the so-called “Gunpowder”), without making a 100g pack containg thousands of such granules unaffordable: There are, of course, machines for this, and production takes place in a sort of assembly line style. Nevertheless, the process proves to be complex, multi-staged and time consuming. 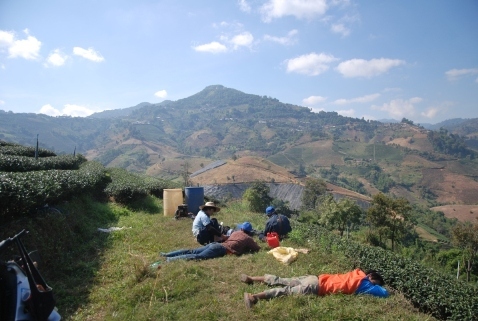 However, we also learn that in Doi Mae Salong tea leaves for the more precious teas are still completely handpicked, always 2 leaves and a shoot at the time, a technic no picking machine is really able to reproduce and that requires great skills and years of experience from the pluckers. 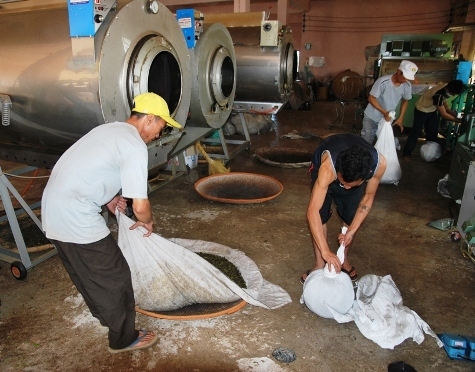 Then the tea is poured from the tilting drum and packed in a cloth, which is then wrapped to form a bale. 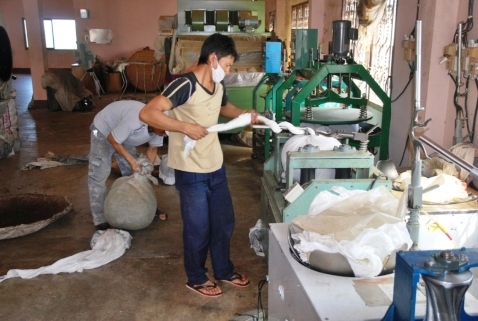 The bales are then wrapped up tightly and placed on a sort of churning machine, where they are wrapped up even tighter and then are rotated and churned for a while. Then the bales are brought down from the churning machine and unpacked again. 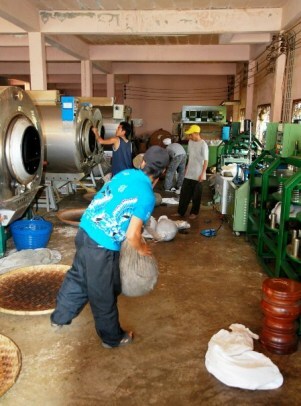 … wrapping up tightly and on upon the churning machine. 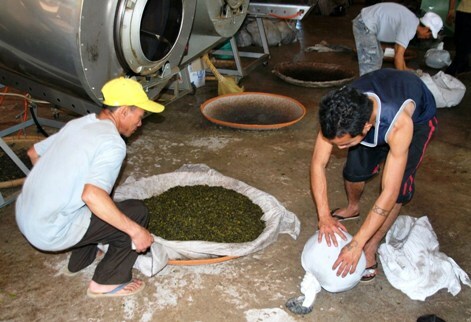 The entire process is repeated several times for an Oolong tea, depending on the desired degree of fermentation, and the centrifuging of the compressed, heated tea obviously has the effect of the the tea rolling themselves into balls. Substantiation is provided by the last heating drum’s output. I realize that this must have been once done by hand, but nowadays, of course, I could neither expect nor pay that. 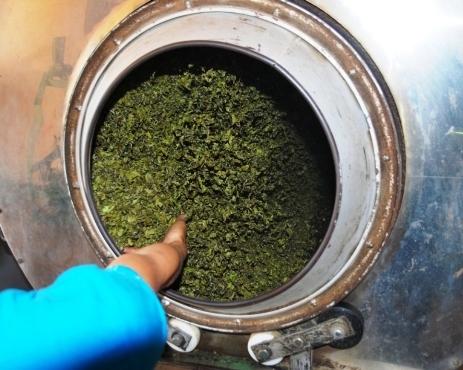 The proceeding of Green tea is less of an effort, because the tea laves are subjected to the boiler procedure only once, and without or lower heat supply. I don’t see it that day, but I learn that the flavoring of tea leaves with jasmine or Thai jasmine rice also takes place in these boiler drums and under heat supply. 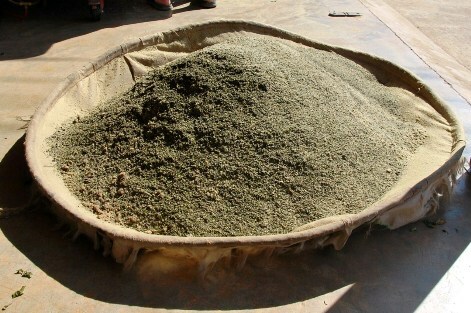 The tea dust remaining in the drums after this process is collected and sold at the price of one dollar per kilo. It is used as a food additive and as forage. 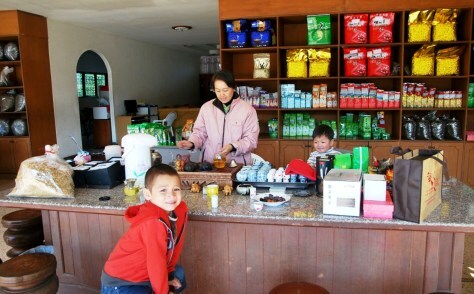 I stroll back to the shop of “our” Doi Mae Salong tea family, located only 50 m from their factory, where Alex, who quickly got bored with the factory soon, peacefully plays under the tea mama’s supervision with their youngest son, both of them having great fun. The ensuing hours go by with establishing my Doi Mae Salong tea order. My goal is the purchase of a representative sample. This sample in the end consist of a total of 14 teas: A number of Oolong and green teas of different quality and price classes, a tea flavored with jasmine flowers, one flavored with Thai jasmine rice, a four-season tea (to be harvested four times a year), a Ginseng Oolong tea, and Jiaogulan, the legendary Chinese “immortality herb”. Black tea (Chinese: “red” tea, Thai: “Chaa Deng”) ist not available yet at this time. This, along with Osmanthus and Dong Ding tea, will later be added to my tea portfolio. After long negotiations concerning prices and quantities over endless cups of tea, a “sample” of 24kg tea is ordered , definitely enough to satisfy my own tea needs for lifetime. Two of the family’s daughters immediately take on the packaging task. Each pack is individually filled, weighed and then sealed in a vacuum packaging machine. The Chinese design of the tea packs are very genuine and the vacuum packing method leaves nothing to add. The individual packages are packed in large card boxes and I’m starting to worry about how I will transport them to Chiang Mai the next day. I mention my concerns towards the shop owner, who in response climbs on on her motorcycle and roars off. When she comes back 10 minutes later, she tells me she has found a Songthaew driver, who’d be willing to take me to Chiang Rai the next day at a time of my choice for 800 baht (25$US), an offer I can’t refuse, watching the card boxes filling up and becoming heavier by the minute. 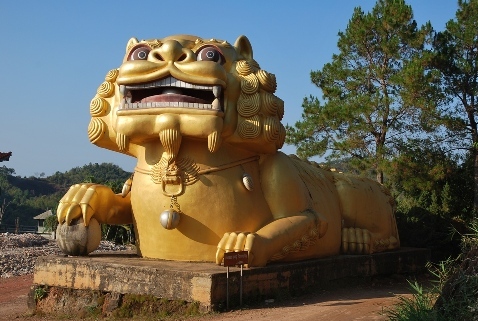 The two remaining items on the day’s agenda are a visit to some Doi Mae Salong tea gardens and the enjoyment of the much vaunted view from Doi Mae Salong’s Chinese temple located on top of the mountain. I am sure that the shop owner will be able to help us with this as well, an assumption that proves to be correct. It explains a motorcycle taxi driver exactly what I want, and he agrees to bring us to both destinations at a total rate of 150 baht (about 5$US). We leave Doi Mae Salong in the direction of Mae Chan and turn left after about 1km. The motorbike carrying all the three of us goes down a steep, sandy dirt road, the whole thing looking dangerous and probably being so, but our driver reassures us telling us that he does this all the time, so I am trying to feel reassured. Once arrived at the bottom, it shows that we actually got to the top, more precisely to the upper edge of a vast tea plantation. In order to to get photos from other perspectives, too, I start the descent. After only a small part of the way, new perspectives are opening up. Half way down I pass a small group of tea plantation workers, who are just taking a break and have made themselves comfortable on a shoulder of the hill in front of a particularly beautiful background scenery. I wonder to which extent the locals themselves know how to appreciate the scenic charms of their home area, for them probably being a matter of course. A question I cannot answer with final certainty, but I think the fact that they choose this place for their break, substantiates the idea that at least they won’t entirely lack a sense for the scenery’s charms. Back at the top, we once again climb onto the back seat of our motorbike taxi, and on it goes to the temple enthroned high above Doi Mae Salong. A 20 minutes steep uphill ride later, we are rewarded for our decision not to miss this tourist highlight of Doi Mae Salong. 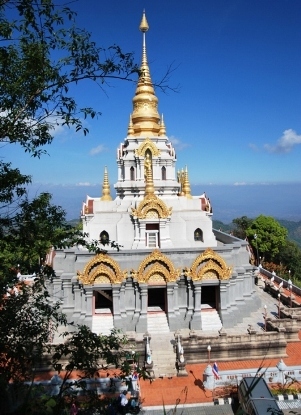 The temple itself is less spectacular, but it has an observation deck on its 2nd floor that allows for a 180 degree panorama view of Doi mae Salong and the surrounding area. The temple has an adjoining building, in which the usual Buddhist relics (Buddha statues, illustrations from the life of Buddha, etc.) might be kept, or not, fot that matter, since I see no hint whatsoever pointing to a Buddhist or other particular religious orientation of the place. The building is closed, so we might never know. …while to the right, a view over wooded mountain landscape opens up. On the way back to town, our driver makes a little detour to show us the Doi Mae Salong Tea Monument. What do we get to see then may be disputable from an artistic point, but definitely exceeds my expectations. 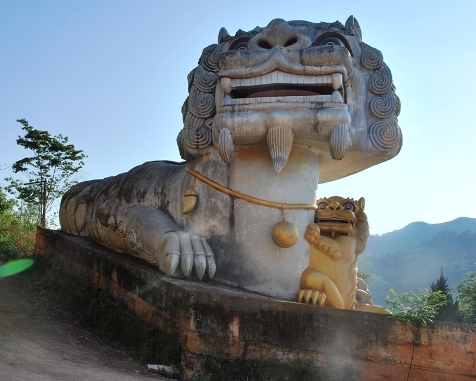 The tea monument’s entrance is guarded by a giant pair of lions. …the stone image of the female lion, holding her paw protecting around the lion baby nestled into it, expresses some more facettes. …the other one golden and placed on a “heater stove”, accommodating a tea room in its interior, which is closed at this day, unfortunately. 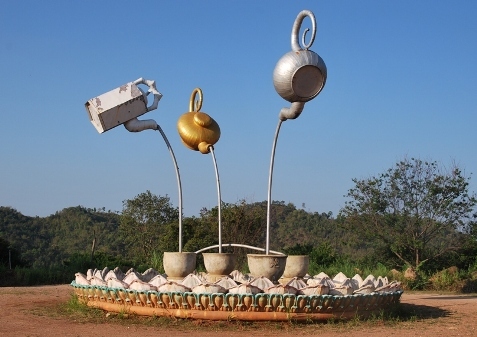 The Doi Mae Salong tea monument is completed by a “3-teapot-artwork”, which inevitably reminds of a well, but without water. 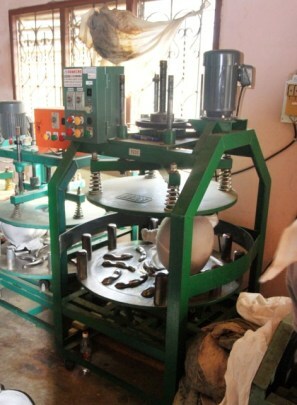 The pots give the impression of freely hovering in the air, but actually “stand” on the “beams” of the “liquid” that “flows” from the teapots, which are bended forward for pouring. On the way back to town, I discover a Buddhist temple, otherwise the most ordinary of all phenomena in Thai village and town sceneries, but not so in Doi Mae Salong: even buildings which seem to be temples at first glance, often house no Buddhist relics and no monks either. More likely, they might be expressions of Chinese spirituality or arts worshiping. 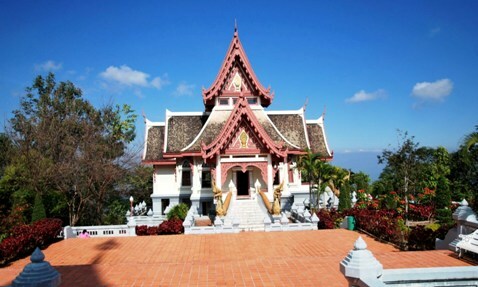 This is however clearly a Buddhist temple, with all of the characteristics of a typical Thai Temple, and as many of those it sits in a particularly picturesque spot, in this case on a hill on the outskirts of town, against the backdrop of a beautiful natural scenery. 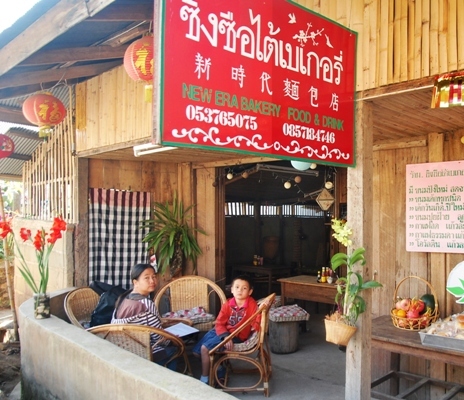 After a short visit to our Guest House, we walk along a stretch of the main road and stop at the “New Era”, a small restaurant with an attached bakery, which is run periodically by a nice young Frenchman (Thomas) and his Thai girlfriend. For a change, there is Thai food available here, as well as town’s only cheese sandwiches, along with a Western style breakfast of toast, eggs, coffee, cakes. etc., which we decide to get back to the following morning. We also pay the “Tea Festival” another visit, on our way there accompanied by a magnificent sunset over the hilltops of Doi Mae Salong. We’re making a final round of the tea festival grounds, not missing another drop-in at “our” tea stall for a cup of that tea scented with Thai Jasmine rice (“Chaa Khao Hoom”), which we both particularly like. 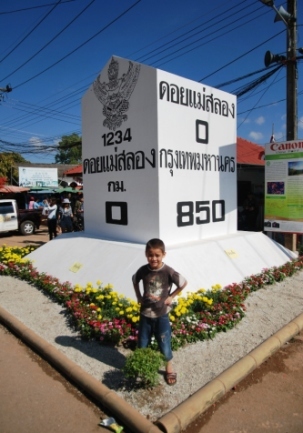 The next morning, after a hearty breakfast at the bakery run by the young Frenchmen, we meet with our songthaew driver at the town’s mark 0 km stone. 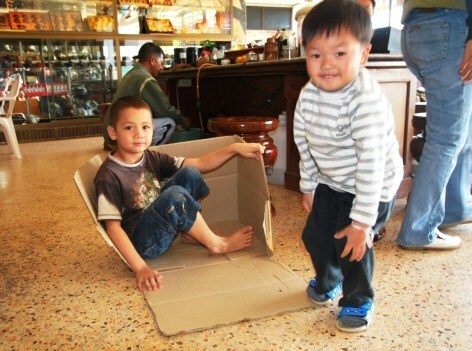 5 minutes later, we pick up my luggage at the Guest House, another 5 minutes later the tea boxes at the shop follow. 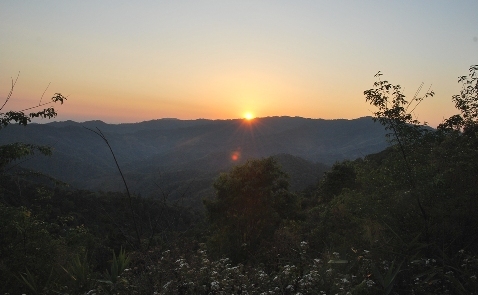 I leave Doi Mae Salong with one crying and one laughing eye … I think this place will see me again soon.